When the new Fitbit Blaze was introduced at CES 2016 in Las Vegas Tuesday, the fitness tracking watch might have looked a little familiar. The wearable's sleek new design reminded a lot of tech insiders of the Apple Watch, at least on the outside. The Fitbit Blaze, priced at $199.95, comes in three colors -- black, blue, and plum -- and does everything the old Fitbit did, but with a new look and functionality. It has a colorful touch screen and consumers have the option to buy sleek leather bands or metal link bands and frames. 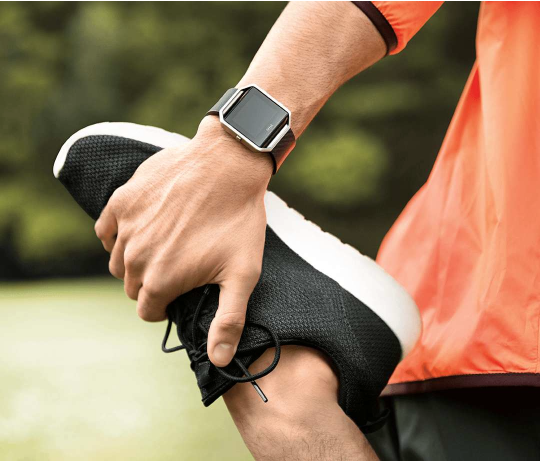 In addition to carrying out its standard fitness-tracking tasks, the watch can receive calendar alerts and text notifications. "The Blaze uses your phone's connection to track GPS for runs and to get buzzing notifications for incoming calls, texts, and calendar appointments. But that's it: this won't be full of Facebook messages or have separate apps" like an Apple Watch, noted the CNET review. First impressions of the device drew some mixed responses across social media. But investors did not seem so impressed with Fitbit's foray into new territory. The company's stock dropped more than 5 percent on Tuesday. Fitbit Blaze goes on sale in March, and some users complained about how this release comes so close after the holiday season, when many received soon-to-be outdated versions as Christmas gifts. WOOHOO! A waterproof @fitbit https://t.co/SkZkoXyw33 #fitbitblaze darn it! Just bought my surge, now I want a fitbit blaze! Health trackers were a popular gift in 2015. Fitbit saw its iOS app shoot up 20 spots on the "free apps" list at Apple's App Store right after the Christmas holiday.